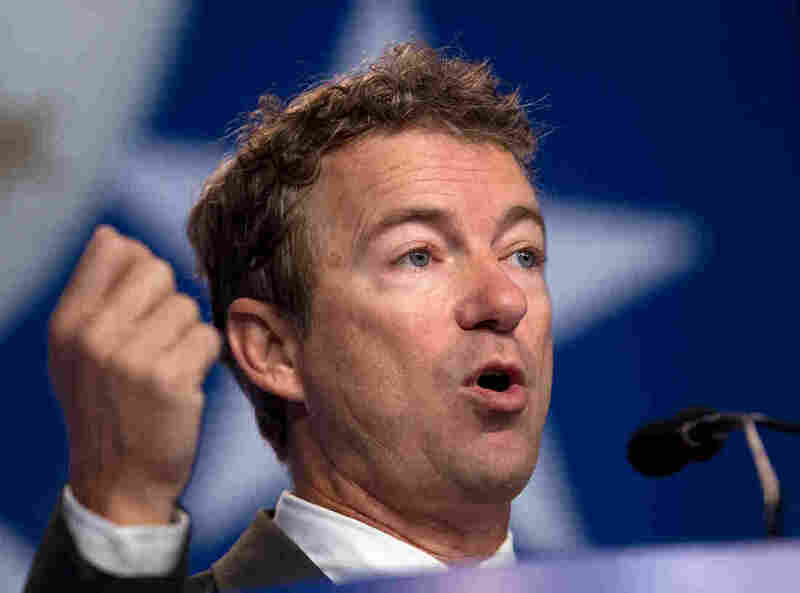 How Long Must Rand Paul Stay In 'Detention' For Plagiarism? : It's All Politics That's what the Kentucky Republican wants to know, after being criticized for using the work of others without attribution. Paul, who appears to be preparing for a run at the 2016 GOP presidential nomination, is now on the offensive. Sen. Rand Paul, R-Ky., is sorry for the plagiarized material in his speeches and op-eds. And he thinks some journalists are just plain sorry. B) Acknowledge that mistakes were made, then lash out at the news media? Sen. Rand Paul, R-Ky., has been going with the second option lately. But then Paul once again tried turning the tables on the journalists who have hounded him for publishing pieces under his name or giving speeches that used lengthy passages of others' words without any attribution. "I'm being criticized for not having proper attribution, and yet they are able to write stuff that if I were their journalism teacher in college, I would fail them," Paul told Costa. That was building on his comment from the weekend about "hacks and haters" he wishes he could duel. That hypothetical seems a little awkward — someone who's admitting to plagiarism imagining himself a journalism teacher. But let's move along. Paul seemed particularly peeved by reporting on a speech he gave at Liberty University in Virginia last October. Journalists didn't accurately convey the theme of his speech so far as he was concerned, which explains the journalism-teacher gibe he aimed at the media. The senator, who appears to be preparing for a run at the 2016 Republican presidential nomination, also mused: "I feel like if I could just go to detention after school for a couple days, then everything would be OK. But do I have to be in detention for the rest of my career?" If Vice President Biden's career is any guide, the answer to that would be no. Paul might take some comfort from how Biden was able to rehabilitate himself after revelations emerged during the 1988 presidential campaign that he had repeatedly plagiarized other politicians. It's proof positive that plagiarism is certainly not a political career-ender. Paul has seen in his own family how a politician can get past controversy about writings attached to his name. Ron Paul, the former Republican congressman from Texas and the senator's father, came under fire for newsletters published under his name that contained racist, anti-gay and anti-Semitic statements. The elder Paul distanced himself from the objectionable material by saying someone else wrote it and, beyond that, claimed he didn't even know about it until someone pointed it out to him. Which leads to this irony: Assuming you accept the elder Paul's explanation, both father and son got in trouble for words they didn't write.